New hope: Students at the St Teresinha College celebrating the reopening of the school. CHILDREN in East Timor can head back to their school after it was reopened last week thanks to the tireless efforts of a Gold Coast couple. A team from Brisbane’s Catholic Mission visited the town of Ossu to witness the reopening of the war-ravaged, 450-student St Teresinha College – stage one of a building reconstruction project that is the brainchild of Burleigh Heads couple Sue and Bren Milsom. “We always knew it could happen – Sue and I are a determined pair – but it was sometimes touch and go as to when it would happen,” Mr Milsom said. The Milsoms have spent much of the past five years raising money in their parish through a craft stall, as well as networking and visiting East Timor to realise stage one of the $US186,000 school reconstruction. The couple first came to East Timor as part of a Catholic Mission immersion trip. They fell in love with the people and the place, especially the region of Ossu, in Timor’s mountainous east. Mrs Milsom paid tribute to Ossu’s teachers, parents and students, who adapted, to allow for the rebuilding of the senior campus, by relocating onto the nearby primary campus. “Being a teacher myself, I know what an impact any sort of disruption can have on both your ability to teach and the students’ ability to learn,” Mrs Milsom said. 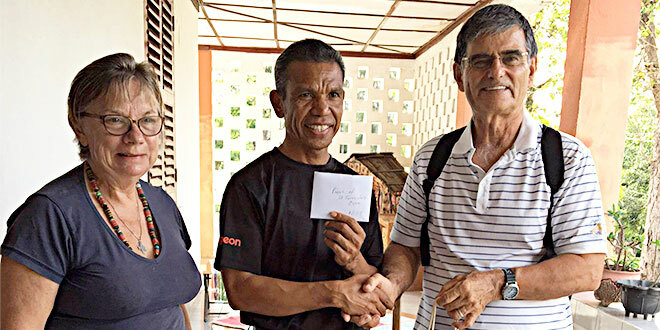 With his extensive knowledge of the Timorese culture, history and people, coupled with his obvious passion, Mr Milsom has recently become a facilitator for Catholic Mission immersion programs. Ironically, one of his first trips was leading a group from Assisi College at Coomera, a school that also gave a fellow participant on this current trip, Jessica Laidler, her first taste of life in East Timor. “I came to Timor when I was in Year 10, in 2012. Back then, however, our group didn’t visit Ossu so this is a real privilege to be here for this opening,” Ms Laidler said. Changing lives: Burleigh Heads couple Sue and Bren Milsom (right) in East Timor for the reopening of St Teresinha College. The Ossu region was severely impacted by the fighting and violence that occurred during 25 years of Indonesian occupation. Many of the guerillas fighting for independence used the hills and forests of the Ossu region for survival. Ms Laidler, who now works for Catholic Mission as a donor relations officer, has also found the trip a welcome opportunity to apply some of the insights gained from her degree in International Relations at Bond University. “Seeing as the political environment between Australia and Timor-Leste is currently tense, I was interested to see how everyday civilians responded and interacted with us. In typical Timorese fashion, they treated us with love and respect,” she said. 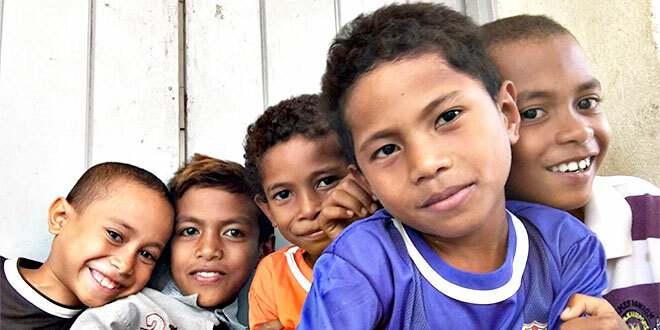 For Ms Laidler’s manager, Catholic Mission Brisbane director David McGovern, his first trip to East Timor has been uplifting and eye opening. “When you work in the Brisbane archdiocese, you become very aware of how many parishes have some sort of connection with this country,” Mr McGovern said. “Now I am beginning to understand why this connection develops in the first place and also appreciating what a significant impact the spiritual and financial support, offered from these communities, is having in the country. “My experiences here will enable me to share, with donors and other stakeholders – parishes, schools, corporates – why agencies like Catholic Mission need to exist and what a difference we can help make.